Sway progress report. Lookie Lookie! Sway cardie is buried in the depths of my bag right now. After knitting about 4 inches, I discovered that I had done the fatal careless cast on. Missing casting on about 10 stitches resulting in a much skinnier back piece and didn't discover this major brain fart until I'd knit up about 4 inches. Deep breaths. Okay. Started over given the happy fact that I have many more balls of wound yarn. Got to a little more than the point I was at in only two days. Then my McGuyver-like pieces o string of yarn counters fell off, yet again. Then, in another brain numbing eye opening session of examination (I seem to examine when I can't figure out what is going wrong) that I had accidentally purled a few knits down by the ribbing. Oh, nothing major. But enough to irk me to pieces. I think I finally found the one thing I might be a control freak over. Really, I am not quite sure why, other than the fact that I want my sweater to be perfect since I'll actually wear it and and. Aauuugah! I need to stop harping. I just need to sit down, drop that stitch 40 some times, then crochet pick-up back up and repeat for all of them. Hey, it beats re-knitting the entire back. Not enough room to breathe, but enough to take a bit of the remainder of the evening lightly when I came home around 9:30. Congratulating myself (and my project partner Joanna, yes Joanna from high school) for having done swimmingly well on our project. Went and bugged my dad with snippets of comments I perceived in my puffed up state as praise from my Prof. Now just some more documentation and the second part of the project. And the final. 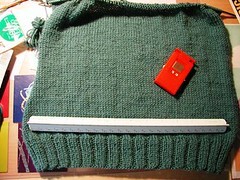 Started a new knitting project today- Sway Sweater by Kim Hargreaves on the knitrowan website. The yarn is the Debbie Bliss Merino DK I bought fairly recently at a sweet Uncommon Threads sale. $3 a ball for 110m! Yes, in the color of this webpage. Mouldy green may just be my default color. I almost purchased a lovely darker blue with a slight bit of green-grey in Merino Aran but the yardage was so much less for the same price. That turns out to have been a slightly bad choice. Read on for a few things I've learned in the process so far. Especially point #6. #6 is a wonderful point I wish someone had told me about before I parsed (yes I am a geek) an entire graph for the back and left front. This page is a archive of entries in the sharp points category from March 2005.
sharp points: February 2005 is the previous archive. sharp points: April 2005 is the next archive.